An original letter of correspondence between brothers and business partners Joshua Coffin Chase and Sydney Octavius Chase. 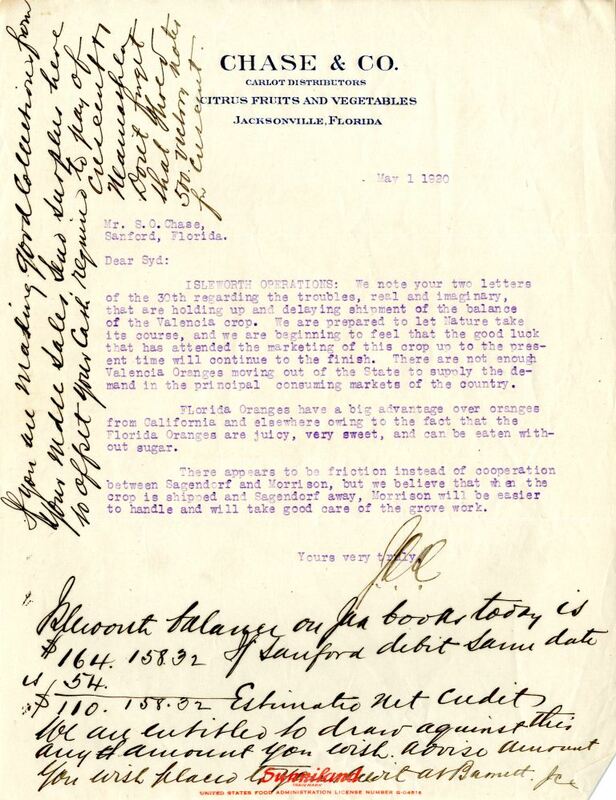 Topics discussed in the letter include issues delaying the shipment of the balance of Valencia oranges from Isleworth Grove, Joshua's optimism in regards to the crop, the higher quality of Florida oranges compared to California oranges, and the friction between Mr. Sagendorf and Mr. Morrison. Original letter from Joshua Coffin Chase to Sydney Octavius Chase, May 1, 1920: box 49, folder 20.84, Chase Collection (MS 14), Special and Area Studies Collections, George A. Smathers Libraries, University of Florida, Gainesville, Florida. Digital reproduction of original letter from Joshua Coffin Chase to Sydney Octavius Chase, May 1, 1920. ISLEWORTH OPERATIONS: We note your two letters of the 30th regarding the troubles, real and imaginary, that are holding up and delaying shipment of the balance of the Valencia crop. We are prepared to let Nature take its course, and we are beginning to feel that the good luck that has attended the marketing of this crop up to the present time will continue to the finish. There are not enough Valencia Oranges moving out of the State to supply the demand in the principal consuming markets of the country. FLorida Oranges have a big advantage over oranges from California and elsewhere owing to the fact that the Florida Oranges are juicy, very sweet, and can be eaten without sugar. There appears to be friction instead of cooperation between Sagendorf and Morrison, but we believe that when the crop is shipped and Sagendorf away, Morrison will be easier to handle and will take good care of the grove work. If you are making good collections from your [?] sales [?] surplus here to offset your [?] requires to pay of [?] [?]. Don't forget that [?] 500 victim notes for [?]. [?] balance on [?] books today us $164.158.32. If Sanford debit [?] date is 54. $110.158.32 Estimate [?] credit. We are [?] to draw against this any amount you wish advise amount you wish placed [?] [?]. Chase, Joshua Coffin. 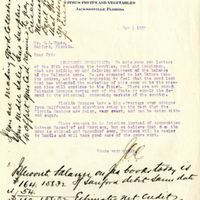 “Letter from Joshua Coffin Chase to Sydney Octavius Chase (May 1, 1920).” RICHES of Central Florida accessed April 23, 2019, https://richesmi.cah.ucf.edu/omeka/items/show/2730.